For other uses of "Angel" in comics, see Angel (comics). The Angel (Thomas Halloway, often shortened to Tom Halloway) is a fictional character, a superhero appearing in American comic books published by Marvel Comics. Created by artist Paul Gustavson and an unconfirmed writer during the Golden Age of Comic Books, the Angel first appeared in Marvel Comics #1 (Oct. 1939), the first publication of Marvel Comics' predecessor, Timely Comics. The Angel is a non-superpowered detective who nonetheless wore a superhero costume. Created by artist Paul Gustavson and written either by him or by Ray Gill or another writer, the Angel debuted in Timely Comics' Marvel Comics #1 (Oct. 1939). The Angel was the next-most-popular Timely character after the "big three" of the Human Torch, the Sub-Mariner and Captain America, with more than 100 Golden Age appearances — starting in that initial Marvel title (which changed its name to Marvel Mystery Comics with issue #2), up through #79 (Dec. 1946); as the sole backup feature in Sub-Mariner Comics #1-21 (Spring 1941 - Fall 1946); and in occasional appearances in All Winners Comics (#1, Summer 1941), The Human Torch (#5[a], Summer 1941), Mystic Comics (vol. 2, #1-3, Oct.-Winter 1944), Daring Comics (#10, Winter 1944-45). A simulacrum of the Angel was temporarily created from the mind of Rick Jones, along with those of the Blazing Skull, the Fin, the Patriot, and the Golden Age Vision, to aid the superhero team the Avengers during the Kree-Skrull War, in The Avengers #97 (March 1972). The Angel is one of the central characters of the eight-issue miniseries The Marvels Project (Aug. 2009 - May 2010), by writer Ed Brubaker and penciler Steve Epting. A costumed detective with no superpowers, the Angel is among the few such heroes to wear no mask, and in his Golden Age appearances makes no effort to conceal his identity as independently wealthy Thomas Halloway, a former surgeon. Thomas' mother died in childbirth - consequently he was brought up in the prison where his father was a warden. There he was instructed by a number of experts, as well as a number of the inmates, which gave him a unique insight into the underworld. He earned his moniker when he saved one of these inmates from the chair. Though he wore a costume like a superhero, he wore no mask to conceal his identity. He later acquires the Cape of Mercury, which allows him to fly, but he has used this ability only occasionally, as on his campaign against the foreign spy Cat's Paw. The Angel was already active by the time of the first Human Torch and Sub-Mariner adventures, and active as far back as 1936. 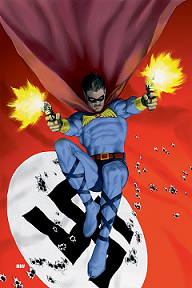 He fights alongside Namor against World War II "Nazombies", and was later retconned as a member of both the All-Winners Squad and the V-Battalion after the war. The Angel was also possibly a Secret Service agent for a brief period of time. Halloway remained active as an older character in 1990s comics, and was revealed as the primary force behind the murderous vigilante group Scourges of the Underworld, which assassinated a large number of lesser supervillains and archcriminals. Confronted by U.S. Agent, Angel was wounded during the battle and arrested for his part in the murders of the Scourge of the Underworld. However, due to lack of concrete evidence on U.S. Agent's part, Angel was let go and resumed his normal life. Halloway's grandson, Jason Halloway, is given his grandfather's mask and weapons at the end of The Marvels Project #8 (July 2010). Due to continuity differences between Tom's appearance and a previous set of appearances, his brother has been retconned as one of two men who had assumed the identity of the Angel and substituted for his brother on numerous occasions. In modern times, he was living as a homeless man in and beneath Manhattan, where he was ambushed and murdered by the supervillain Zeitgeist. He has also appeared in Marvel Super-Heroes vol. 3, #7 (Oct. 1991) and in The Incredible Hulk vol. 2, #432-433 (Aug.-Sept. 1995). It is unknown what occurred between the brothers and why Tom's brother ended up homeless. Thomas Halloway had no superpowers but he was an excellent acrobat and hand-to-hand combatant, an accomplished disguise artist, occult scholar and pilot and a skilled detective. He also wore the Cape of Mercury, which granted him the ability to fly, and used knives and other weapons. An alternate version of the Angel appears in X-Men Noir investigating the death of Jean Grey. This Angel, Thomas Halloway, is depicted as private investigator and the child of the warden of a prison called the Welfare Pen. Thomas' mother died in childbirth - consequently he was brought up in the prison where his father was a warden. There he was instructed by a number of experts, as well as a number of the inmates, which gave him a unique insight into the underworld. He earned his moniker when he saved one of these inmates from the chair. Though he wore a costume like a superhero, he wore no mask to conceal his identity. The final issue reveals that the Angel identity is shared by twins: the idealistic Tom Halloway and his ruthless brother Robert Halloway. Robert sacrifices himself to stop Jean, revealed as having killed Anne-Marie Rankin and taken her place. ^ The Angel (Marvel Comics, 1939) at Don Markstein's Toonopedia. Archived from the original on April 4, 2012. "The character was created by cartoonist Paul Gustavson, who wrote and drew his first adventure as well as many later ones." ^ a b Marvel Comics #1 at the Grand Comics Database. This page was last edited on 18 May 2018, at 02:54 (UTC).